Fresh homemade pizza whenever you want it! 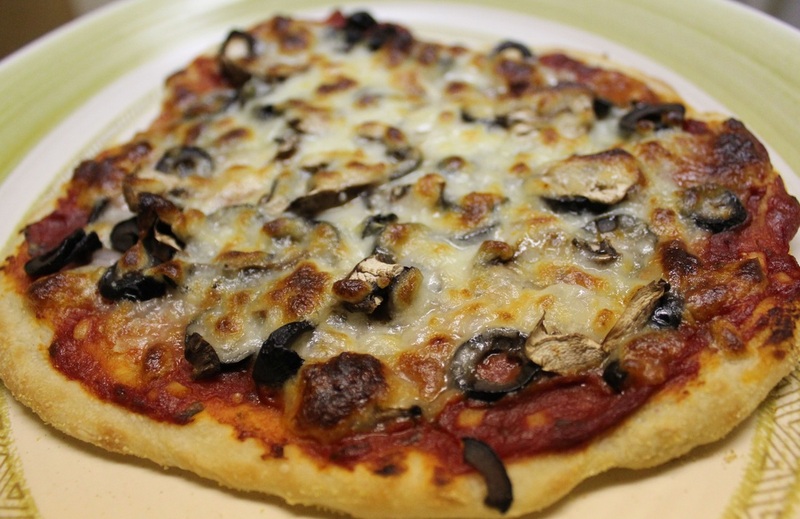 This easy to make pizza recipe can be topped with any of your favorite toppings, just don't add too many or the crust won't cook properly. Pour water into a large bowl, dissolve the yeast into the water. (about 5 minutes). Stir salt and oil into yeast. Stir 3 cups of flour into yeast mixture. Dough should be soft but not sticky. Gradually add more flour if needed. Turn dough out onto a floured surface and knead until smooth and elastic (about 5 minutes). Continue to add flour if needed. While dough is rising make the sauce. Heat a small saucepan with 1/2 tablespoon olive oil over medium heat. Saute minced garlic until tender. Pour wine into the tomato sauce (add water if sauce gets too thick) simmer on low until ready to use. When dough has doubled, punch down and knead into a ball on a lightly floured surface. Divide the dough in half. Roll each half about 3/4-inch thick. Gently pull each pizza into a round about 10 inches in diameter. Coat two pizza pans with cooking spray, place one pizza round on each pan. Spread 1/2 the sauce on each pizza. Top with your favorite toppings. Bake at 500 degrees on the middle to lower racks of your oven for about 12-15 minutes or until crust is browned and cheese is melted. If you cook both pizzas at the same time make sure you rotate the pizza and switch racks halfway through cooking. This will allow both pizza bottoms to cook evenly.